This established and highly acclaimed book, in its tenth edition, is now published for the first time by Cicerone. Venturing into remote areas involves a degree of risk. Minimizing these risks, while feeling confident in your ability to deal with any potential injury or illness, is part of the challenge and satisfaction of wilderness travel. Part 3. PROBLEMS AND THEIR TREATMENT – specific accidents and illnesses. 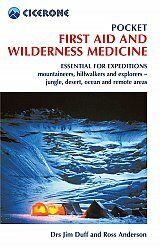 The authors’ wilderness experience was gained as mountaineers in Scotland, Norway, the European Alps, New Zealand, the Himalayas and Antarctica.